This uprated intercooler kit for the Mk7 Fiesta ST 180 is a direct replacement for the Original intercooler with no cutting of any body or trim. The installation utilises the original boost pipework and air ducting , but by using all the available space and replacing the original 50mm thick core with a 70mm replacement the gains were made. With different benefits obtainable through using different core designs, we decided to try all that were available. We have been surprised many times before with the results, as many expect bar and plate cores designs to out perform tube and fin with their thermal transfer properties, and because of this accept the significant weight increases that can be involved. The main reason for uprating an intercooler is to reduce the charged intake temperature as this is directly related to engine power. This is because the amount of power is relative to the density of the air, and density depends on the temperature, pressure and volume. For a given turbo charged engine where the characteristic or specification remain unchanged other than varying the inlet temperature, there is a proven formula to calculate the relationship between the power produced and inlet temperature. In reality power loss through temperature may be greater. Many engine management systems will reduce power due to temperature increases, in order to protect engine components . er the last fifteen years Forge Motorsport have grown in to one of the UK's premier manufacturers of products and accessories for race, competition and road vehicles. 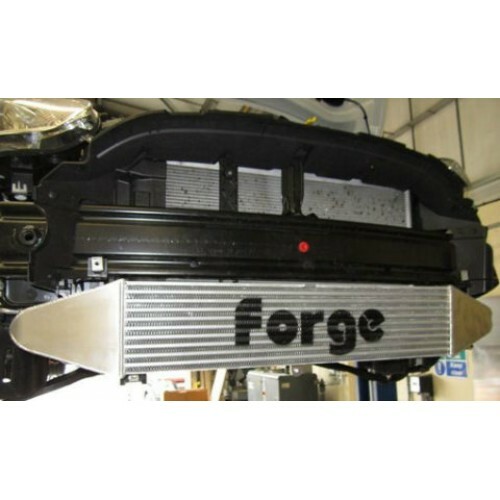 When you purchase from Forge Motorsport you are assured of quality products and a service to match. If you require a particular product that is not listed in this catalogue or on the web site, please call or email and we will gladly assist with any queries. All Forge products are guaranteed for life with the Forge "No Hassle" service promise. Copyright © 2017, Part-Box, All Rights Reserved.